Cummings School of Veterinary Medicine at Tufts University underlines the importance of diversity and inclusion as an integral component of the educational excellence for which it is renowned. Its campus-wide efforts are underscored within the Cummings 2020 Strategic Plan with its focus on prioritizing people. Cummings School boasts a broad range of pipeline programs targeting students across the educational system, many from educationally and economically disadvantaged backgrounds. These programs provide academic enrichment, mentoring, internship opportunities, and more for pre-professional and pre-graduate students, and are effective in increasing the diversity of the applicant pool. Recruiting students from racially/ethnically and socioeconomically diverse backgrounds is one step in addressing issues of diversity, climate, and inclusion. Beyond that, programs such as those that promote inclusive behaviors, help underserved communities, strengthen cultural competencies and exposure to global health issues, ensure an effective transition, active engagement and success for all students. Inclusive Learning Institute: Through interactive workshops, discussions, and engaging activities, this four-day institute offered for all Tufts University faculty provides participants with foundational skills and strategies to foster an inclusive classroom environment and promote enhanced learning for all students in their classes. Tufts Veterinary Council on Diversity: Students, faculty and staff champion campus-wide efforts to foster an environment where all individuals are respected, and diversity and inclusion are embraced. Faculty-Student Mentoring in academic fields is promoted through involvement in many of the co-curricular activities offered. Small educational development grants funded by the American Veterinary Medical Association (AVMA) bring speakers to campus to address issues relevant to diversity and inclusion, mindfulness and communication. Ways of Thinking seminar series brings speakers to campus who broaden our perspectives beyond science, addressing the importance of communication and the pitfalls of implicit bias. Listservs, established by the Dean, encourage community exchange and reflection around the topics of diversity and inclusion, gender issues, policy and science. Students are encouraged to take advantage of the many university resources and programs that provide mentoring opportunities and promote wellness and mindfulness for our students. Faculty-student mentoring in academic fields within veterinary medicine is promoted through students’ involvement in many of the co-curricular activities offered. 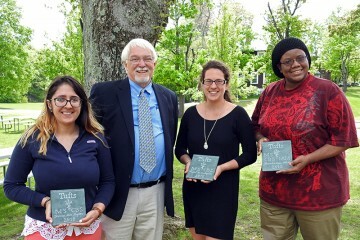 Tufts Veterinary Council on Diversity champions the efforts of several organizations to foster an environment where all individuals are respected, and diversity and inclusion are embraced. 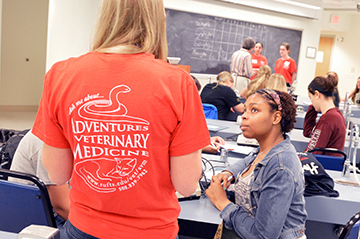 Tufts Veterinary Orientation Program (TVOP) offers incoming veterinary students experiential educational and team building exercises to help them become more aware of their own strengths and communication styles, as well as explore learning/working in a team. Students find ways to support each other and the importance of being open to differences between themselves and their peers. The Healer’s Art course offered to 1st and 2nd-year veterinary students provides a foundation to help them cope with the mental health and well-being pressures of the veterinary profession. Cummings Support Center (CSC) provides resources to assist students in sustaining their overall well-being through Student Academic Support Service, the Career Counseling Service, and Cummings Behavioral Health Service. Provost’s Diversity Reception brings together diverse graduate students from across the campuses in a social and networking atmosphere. 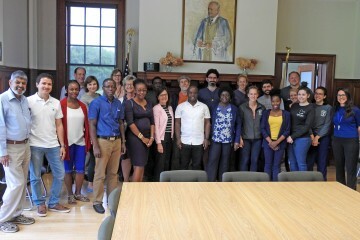 Multi-Ethnic Graduate Alliance (MEGA) is a cross-campus Tufts organization that brings together graduate students from diverse backgrounds and life experiences for social and educational events. 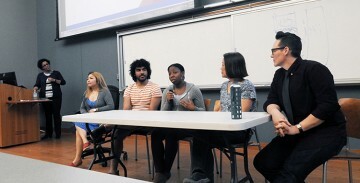 Faculty and students at Cummings School lead a campus discussion about diversity in veterinary medicine profession. There are a number of resources at Cummings School that provide professional development, career planning and support services for students with diverse backgrounds. It is our goal to ensure that all graduate and professional students have equal access to a common set of core services. Career Chats are informal sessions that provide veterinary students with real-life perspectives on career options available within the veterinary profession. 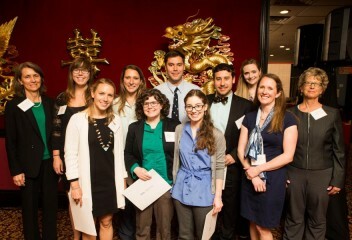 Honos Civicus celebrates and publicly recognizes graduating students who have demonstrated an exceptional commitment to community service and civic engagement during their studies at the Cummings School of Veterinary Medicine. 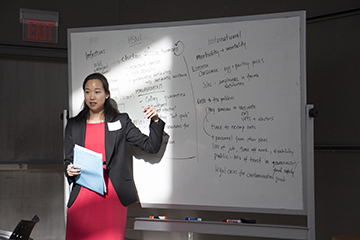 Programs that integrate community engagement into the curriculum, whether it’s through community-based practicums, community service learning, or clinical rotation, provide opportunities to expand our students’ experiences and increase Tufts’ visibility in, and civic engagement within the community.